This one started for me a while back, but symptoms were never severe enough for me to investigate. Try to restart while the car was still warm, i.e. within 15-30 minutes after I shut it off. In those cases, it would never fire on the first attempt to re-start, but would always fire and start up on subsequent attempts. Weird. Taking a look via VAG-COM, I discovered the code to the right (P310B), cleared it, and it usually came back after the next drive, whether I encountered the above symptom or not. Outside of this, I could tell no difference with the car, so while annoyed - but also while in my busiest time at work in years - I didn't investigate further or take it to AMD to troubleshoot at the time. Cut to this past week, when the car stalled once coming off the highway, and then stalled two days later once at a light, and once just before entering my driveway; each time at, essentially, idle. Now I figured it was time to do some logging to see if I could get any smarter about the problem or not. 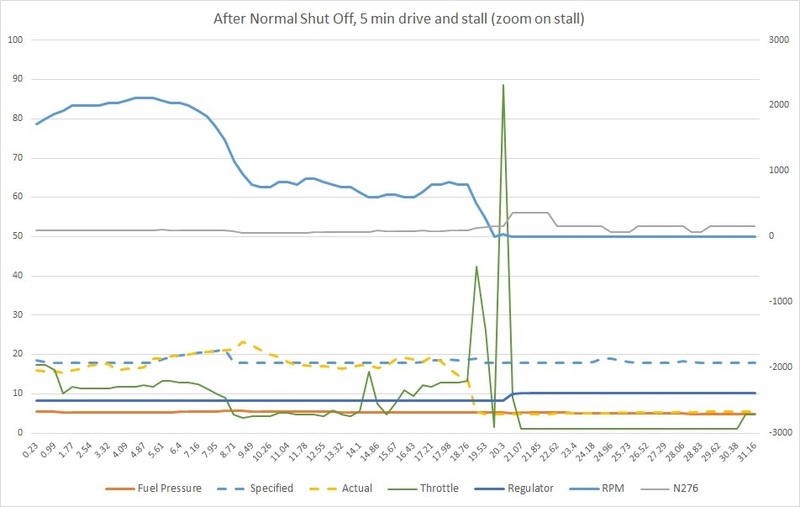 I logged blocks 003, 140 and 103 to get more details on fuel delivery and came up with the following views during normal shut down and also when it failed. This is from final seconds of a normal shut off. 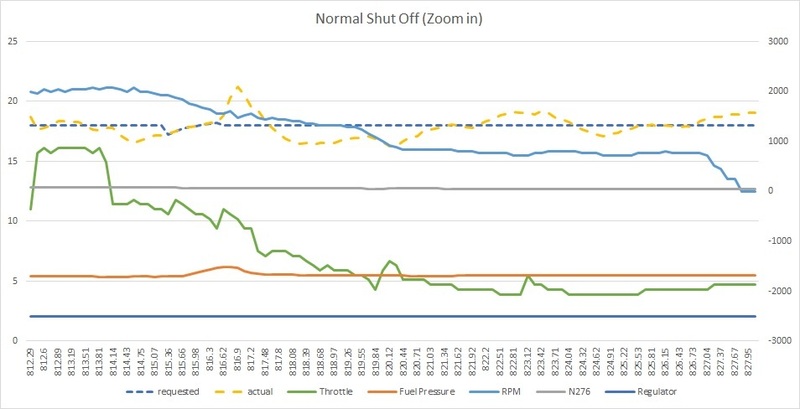 Notice the dotted blue and yellow lines (requested and actual fuel rail pressure), which are relatively in line with each other. This is zoom in on when the car stalled out. 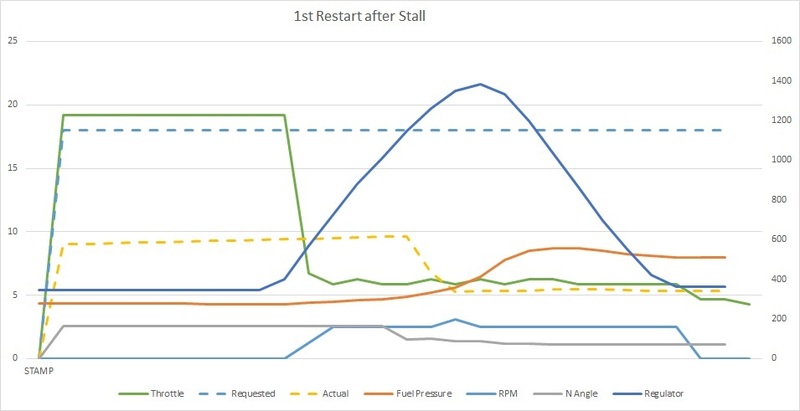 Notice how actual fuel rail pressure drops just before the car dies, while requested stayed the same. Finally, the view when trying to re-start. Note that actual is still far off from requested, and that car never did re-start successfully during this attempt. I was going to monitor a bit more when on the next day on my way to work it stalled out while going through the ole' Starbucks drive-thru where I was able to restart it 3 times, and keep it from stalling further by keeping my foot on the gas pedal, but alas it died one more time and wouldn't restart...tow-truck hauled her away to AMD. Jason inspected and determined the low pressure fuel sensor was at fault. He replaced it, and voila, all better. I drove the exact same route today, idled even longer in the drive-thru, and she kept humming along without issue. Bonus: I DO believe the 'not re-starting after warm' issue is also fixed by this. A couple of adhoc tests confirm that so far. I logged again tonight, and the actual vs requested looks very much the same as during the normal shut-down above, so nothing really to see there.